Crowds of chocolate lovers gawked Sunday at a massive wedding portrait made entirely out of candy. The bride wore a white Tic Tac gown and rock-candy veil. Black M&Ms made the groom’s suit. A rainbow’s variety of Nerds, all separated by color, made the bouquet. Black licorice rope outlined each flower. People who paid $50 to be at the IU Art Museum stood in front of the candy portrait and giddily found Red Hots, Twizzlers and chocolate sprinkles. “Love Sweet Love” took 40 hours to finish and wore a $5,000 price tag. It didn’t sell at Sunday night’s Art of Chocolate fundraiser, but it won Best in Show. Schroeder was inspired by a similar candy portrait of Beyonce that she saw on her honeymoon at the Ripley’s Believe It or Not Museum in Orlando. So she decided to use candy to commemorate her wedding day and wouldn’t have been upset if it sold. “I can always make another one,” she said. The Art of Chocolate fundraiser kicks off Bloomington’s Week of Chocolate each year with chocolate and wine tastings, live music, gallery tours and a juried art auction. Tickets, donations and art sales benefit LifeDesigns Inc., a non-profit agency that provides services for people with disabilities. 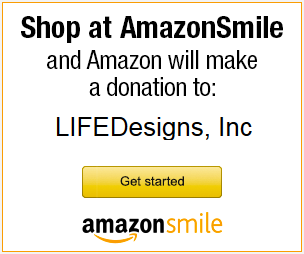 LifeDesigns will use the money raised from this year’s event to supplement some of its programs that lost some funding from state budget cuts, such as its education and work experience programs. The turnout seemed on par with previous years — about 250 people on average — LifeDesigns CEO Susan Rinne said. Ticket sales were good, but organizers were nervous about the IU vs. Iowa basketball game happening at the same hour. Last year, the Art of Chocolate event drew more than 250 people and raised $28,000, both all-time highs. Nevertheless, Rinne said she was excited as always about this year’s event, which pulled creativity from 15 artists and 11 local bakeries and restaurants. She had a taste at each vendor, to be fair. 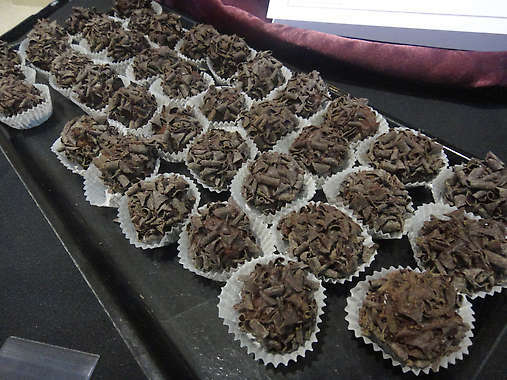 From Angel B’s Galleria of Cakes there were cake truffles — not as rich as a traditional chocolate truffle, less expensive and with more flavor options, chef Mark Brethaur said. He and his wife, Loretta Brethaur, brought cake truffles in three flavors: double chocolate pecan, strawberry amaretto with white chocolate, and coconut rum with marzipan and candied orange peel, dusted with vanilla sugar and dipped in milk chocolate. First-timers to the event, Feast Bakery Cafe brought classic hot chocolate with chocolate marshmallows made in house, and a handful of fancier treats. Dark chocolate creme brulee, bittersweet salted budino and hazelnut feuilletine mousse went fast. Feast chefs ran out of house-made tortilla chips for a popular chicken mole sauce, made with half a cup of chocolate. Malibu Grill served Godiva Double Chocolate martinis made with Godiva white and dark chocolate liqueurs, creme de cacao and vodka. There was no shame in pairing a martini with a glass of wine from Oliver Winery upstairs. Bloomington painter Dan Alexander started and finished a portrait of Martin Luther King Jr., using melted Nestle chocolate, milk and food coloring. He worked busily and fielded questions from casual wine tasters and truffle eaters. The most common question: Can you eat it? “Yes, obviously,” Alexander said, and licked his paint brush. He hoped to sell the painting for $400. Chocolate Bingo — 6-10 p.m. Monday at the Bloomington Moose Lodge #1081, 1580 W. Bloomfield Road. Bingo winners will be given cash and a chocolate treat. Players will be able to buy a meal and beverages. The basic admission package costs $25. Call 336-5281. Making Truffles — This truffle-making class benefits Martha’s House and will take place 6-8 p.m. Tuesday at the Bloomington Cooking School at 115 N. College Ave. Participants will take home samples and enjoy a light dinner. Admission is $45. Call 332-1444. Chocolate Olympics — 5:30-7 p.m. Wednesday in the Girls Inc. gym at 1108 W. 11th St. Competitions include a scooter obstacle course, hoop shoot contest, jump rope contest and cookie decorating. Admission is $5 per person or $15 per family. Call 336-7313. Death by Chocolate Interactive Murder Mystery: “Murder in Casino City” — This event, benefiting Citizen Advocacy of South-Central Indiana, will take place at 7 p.m. Thursday at St. Mark’s United Methodist Church, 100 N. Ind. 46. Attendees will enjoy Lennie’s decadent chocolate dessert with tea or coffee while watching a live play in which actors perform and drop clues about who committed a murder. They will then try to figure out “who dunnit.” Admission is $17 per person; $30 for two. Advance purchases are encouraged. Call 219-5566. Chocolate Prom — 8-11 p.m. Friday at Rhino’s All-Ages Club, 331 S. Walnut St. There will be dancing to live music and free chocolate treats. Formal dress is optional. Admission is $10 per person or $15 per couple. Call 333-3430 or visit www.rhinosyouthcenter.org. Sundaes on Saturday — 1-4 p.m. Saturday at the Monroe County History Center, 202 E. Sixth St. You will be able to design and eat your own sundaes with Bruster’s ice cream and chocolate toppings, learn the history of ice cream making, and enjoy old-time music. Admission is $2 for adults, $1 for children ages 6-17. For members, it’s free. Call 332-2517. Wonka’s Chocolate Carnival — This event, benefiting Amethyst House, will take place from 3-6 p.m. Saturday at the Boys and Girls Club of Bloomington, 311 S. Lincoln St. The carnival, inspired by the movie “Willy Wonka and the Chocolate Factory,” will feature games, activities and contests. There will be loads of chocolate delicacies, including a chocolate river. Admission is $5 per person or $15 per family. Call 336-3570.